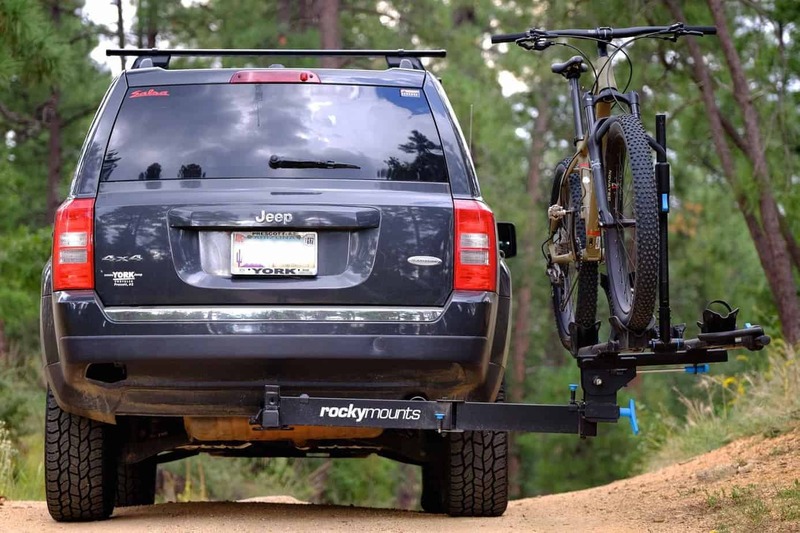 Hitch-mounted bike rack systems with integrated swing-out pivots are not new, but most of them up to this point have been of the less desirable hang-and-dangle style with the bikes draped over two rack arms. Most riders, myself included, much prefer the tray style racks which clamp only to the front wheel and accommodate a wide range of bike sizes and frame formats. 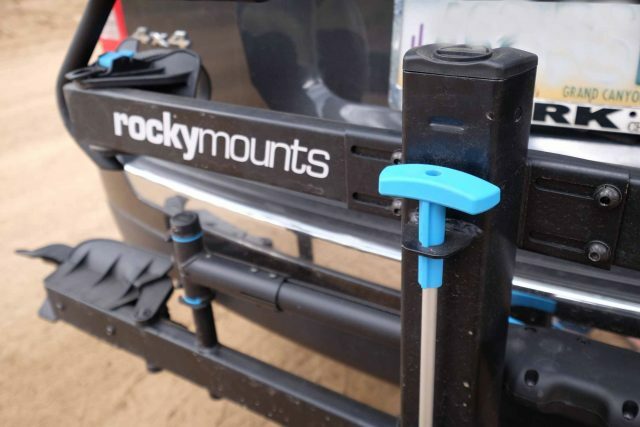 When I first heard rumors of the Rocky Mounts BackStage, a tray mounted swing-out rack, I was pretty stoked to try it. With summer in full roar, I finally got my hands on a BackStage and set out on a few days of camping and riding to put it to the test. Like most road-tripping riders, I live out of the back of my car so the swing-out feature is essential. 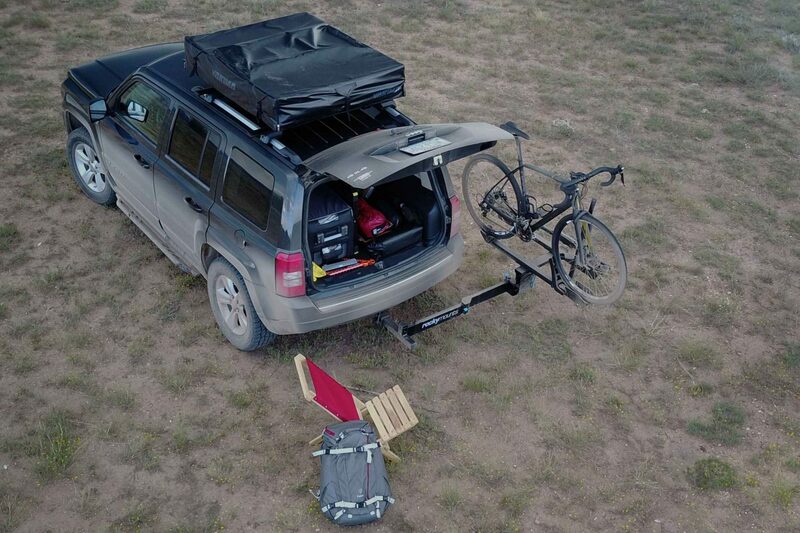 I can’t tell you how many times I’ve bruised my shins trying to access my cargo area while reaching over a bike rack. 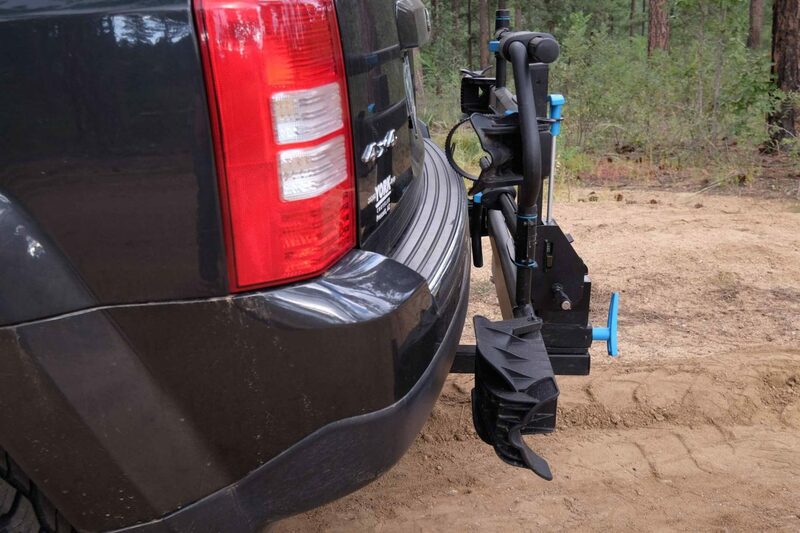 Unlike many other swing-out designs I’ve tried, like the Rak Attach or new Kuat swing-out adapter, the BackStage employs a dual-pivot mechanism which allows the rack to remain close to the vehicle in transit. The adapters I’ve used have forced my racks off the back of my vehicle by as much as 11 inches. 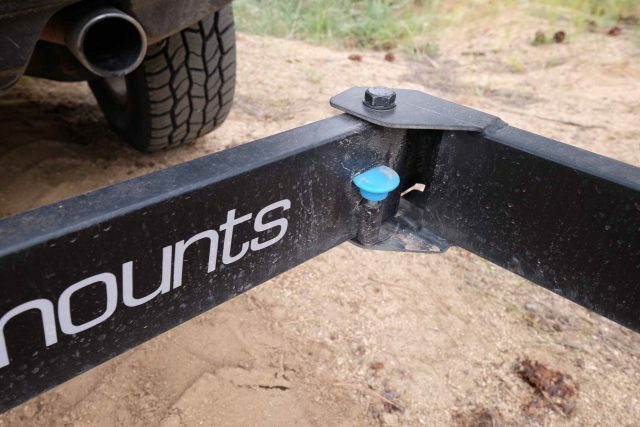 The dual-pivot BackStage has the benefit of keeping the rack close to the bumper, but able to rotate well out of the way of the rear gate. As nice as the hinged rack assembly is, the bike mounts are equally well designed. The two bike trays can be tilted in upright, level, and 30º downward positions. That’s a handy feature as I can often lower the rack enough to open my rear gate without engaging the swing-out. The tilt-release lever is easily accessed on the outer edge of the rack providing good leverage when raising or lowering the trays. 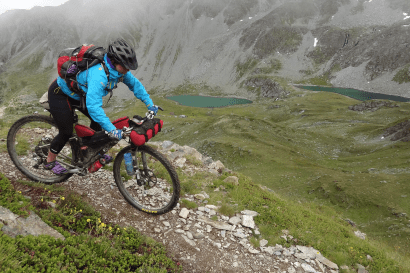 One of the challenges all rack makers face is creating a system capable of hauling everything from skinny-tired road bikes to full-width fatbike wheels. The BackStage does well to accommodate all bikes in all sizes. To reduce the hassles associated with bike-to-bike interference, each tray can be adjusted side to side by 3 inches. On the downside, that adjustment requires a tool, so it’s not a super speedy tweak. 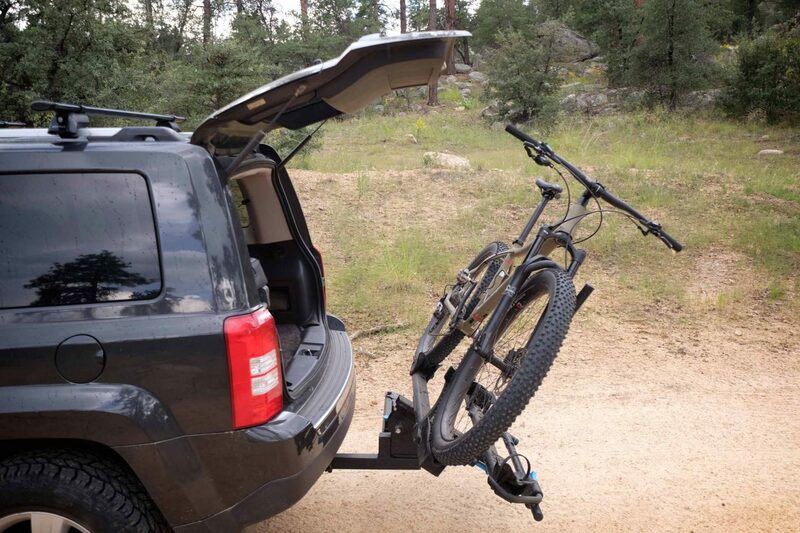 I also noticed the clearance between the bikes was a bit snug when mounting two chunky fatbikes, but they did fit. Overall, I found the fitment from one style of bike to the next quite accommodating. The ability to tilt the rack away from my gate is very handy. Many of the newer racks on the market have refined features like retractable cable locks, but as nice as those add-ons seem at first blush, some of them have proven less than ideal in use. The BackStage comes with a rather basic cable secured to the rack with a locking block. This should be sufficient to thwart the thief of opportunity, but a determined crook will make short work of it. 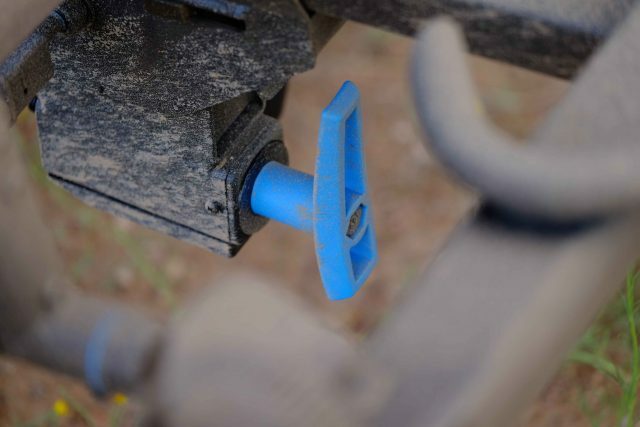 In just the last two years I have evaluated virtually every hitch rack system on the market and have come to learn one thing: No rack is perfect. As great as the BackStage is, it comes with a few peccadilloes of its own, but none of them are deal breakers. 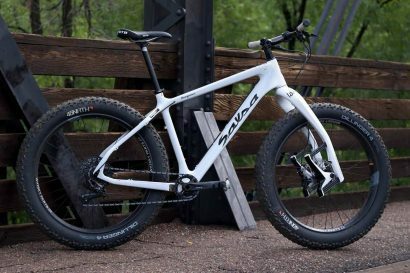 The 63-pound weight is significant, but expected of a rack with the added complexity. 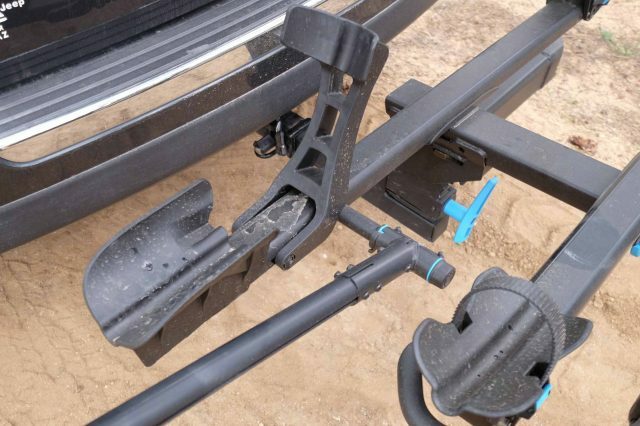 It requires tools to install, although anyone inclined to buy a rack with the convenience of a swing-out is likely to just leave it on most of the time. It’s so easy to tilt or rotate out of the way, I seldom take my rack off anyway. I love how snug the rack sits against the rear of my car. It may not be ideal for every vehicle, but sure works for mine. 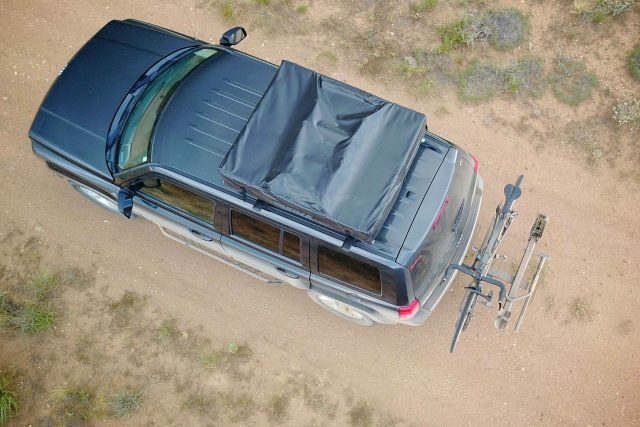 As convenient as hitch racks are, there are times when I prefer a roof-mounted rack. 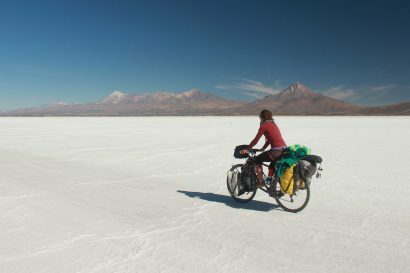 If I’m headed off on a high-mileage road trip, I’d rather my bikes be up top and out of the way. Many experts have suggested roof-mounted bikes are less likely to get stolen and they’re sure less likely to get smashed in a rear-ender. The challenge with most roof systems is finding a solution which accommodates all of the many new fork and hub combos available. For that reason, the SwitchHitter has been my go-to for the last year as it makes swapping from one fork block to the next extremely easy. 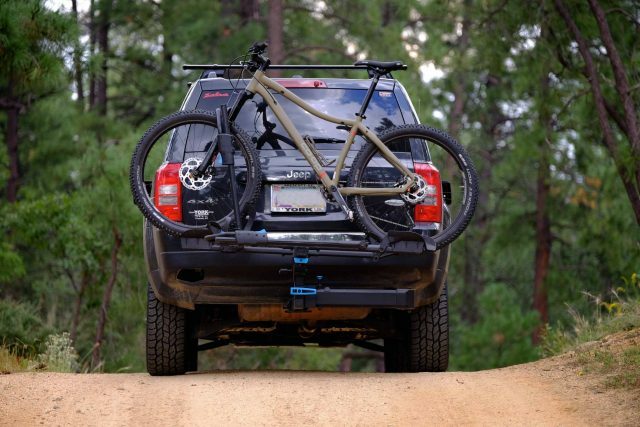 Whether hauling a road bike or my favorite all-mountain slayer, I can fit them to the SwitchHitter quickly and easily. Inside the box are adapters for 12×100, 15×100, Boosted 15×110, and 9-mm quick-release axles. Those blocks can be swapped in minutes and they’re small enough they live in my glovebox always at the ready. 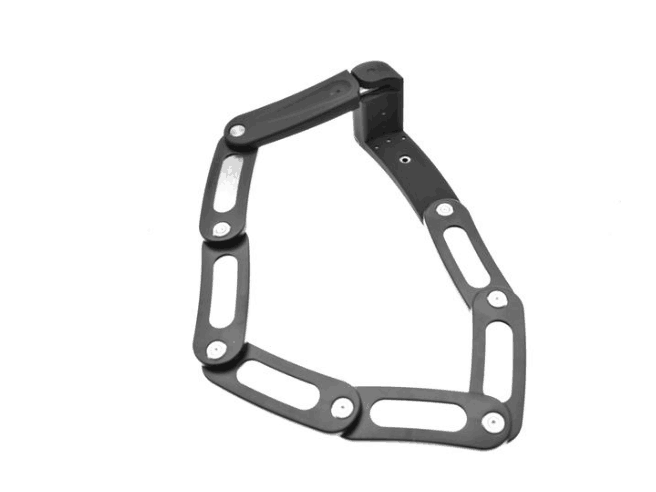 The rack itself is made of high quality aluminum with high density plastic components. 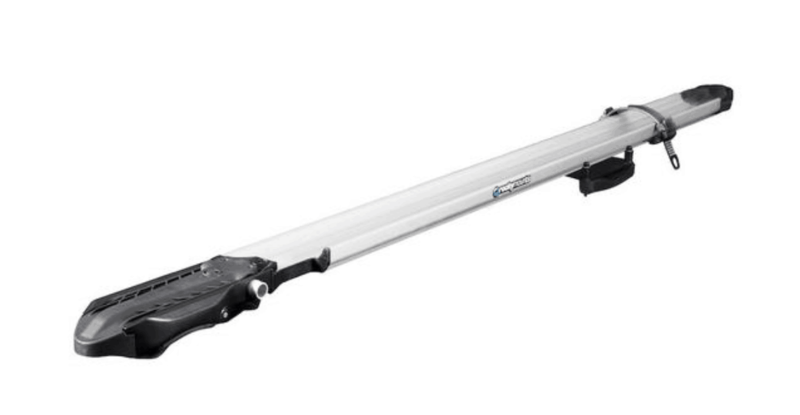 The head of the SwitchHitter employs a clever attachment system which allows it to mate to nearly any crossbar shape from round or square to any of the new aerodynamic bars on the market. Inside the rack tray is a retractable cable lock and an additional lock keeps the rack secured to my vehicle. Available in five colors, I went with unpainted aluminum which compliments most vehicles nicely. One minor issue for some users might be the long 54-inch distance from the head of the unit to the aft end of the tray. 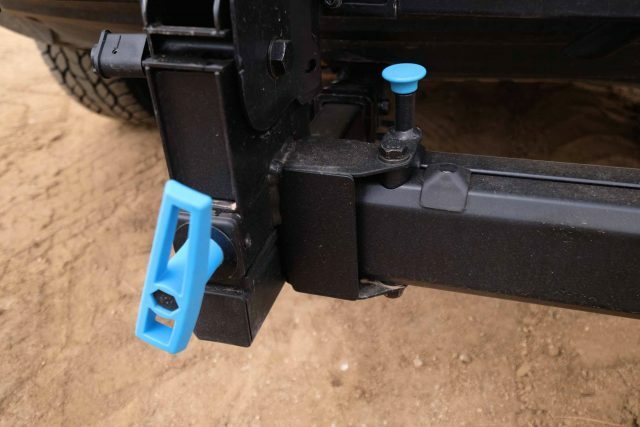 Although it clears my lift gate, others may have to mount the rack backwards if permitted by your rack system. I don’t tend to leave my bikes unattended for very long, but I also never leave them unlocked. Ever. While no lock will guarantee your bike doesn’t get nabbed, I’ve found the latest crop of folding locks to be a great deterrent. New to Rocky Mounts, the Hendrix is small enough I can plop it in a backpack and it lives in my car console year-round. The hardened steel links are 3 millimeters thick, coated in rubber to ensure they don’t damage my bikes, and unfold to a total length of 27 inches. The locking mechanism is easy to engage and more refined than most lock systems in this price category. Better still, the entire unit folds easily into a compact and tight little bundle. After testing dozens of locks in the last few years, the value and security of the Hendrix makes it one of my top picks.